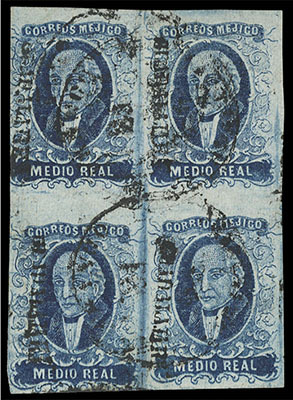 Mexico, 1856, First Issue, ½r blue, Guadalajara, block of 4, Guadalajara town cancel (Schatzkes 297), rich color, Very Fine, scarce multiple. 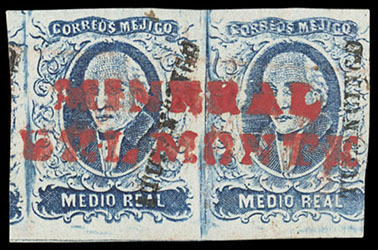 Mexico, 1856, First Issue, ½r blue, Tulancingo, horizontal pair, red straight line Mineral Del Monte out-of-district cancel (Schatzkes 1131), Very Fine. 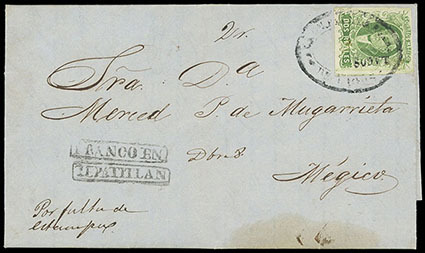 Mexico, 1856, First Issue, 2r yellow green, Lagos, singles on two folded letters from soldier (Republican army) Juan Evangelista Mugarrieta (younger brother of Jose M. Mugarrieta, Consul of Mexico in San Francisco) to family in Mexico City; first with Lagos district overprint and tied by oval Tepatitlan cancel (Schatzkes 696A) with additional "Franco" and Tepatitlán boxed handstamps (Schatzkes 692A, 692) on 1858 folded letter, interesting content telling of just having received new uniforms, of the enemy (conservative) forces facing them and of the expected attack from (General Manuel) Lozano coming from Tepic, enemy force details described, protecting bridge crossing at Colotlán, letter would have had to travel into conservative held territory before mailing to Mexico City, Tepatitlán is 190 miles (317 Km) South from Colotlan, the distance the letter would have traveled before mailing, second with Guadalajara district overprint tied by Guadalajara oval cancel (Schatzkes 295) on 1859 folded letter telling he is well and has sent 90 pesos, letter would have crossed battle lines into conservative held territory and Mexico City, or Juan would have crossed lines before writing this, Very Fine.